Property Location With a stay at Mountain Trail Lodge Vacation Homes in Oakhurst, you&apos;ll be in the mountains and minutes from Golden Chain Theater, and close to Children&apos;s Museum of the Sierra. 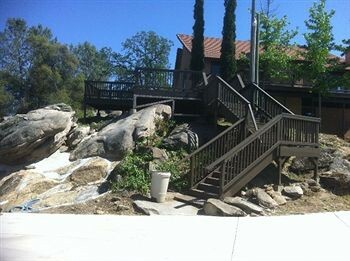 This property is within the vicinity of Fresno Flats Historical Park and Bass lake Recreation Area.Rooms Treat yourself to a stay in one of the 3 guestrooms, featuring fireplaces and LCD televisions. Your room comes with a pillowtop bed. Kitchens are outfitted with full-sized refrigerators/freezers, stovetops, and microwaves. Satellite television is provided for your entertainment.Rec, Spa, Premium Amenities Make use of convenient amenities, which include a fireplace in the lobby and barbecue grills.Business, Other Amenities The front desk is staffed during limited hours. Free self parking is available onsite.